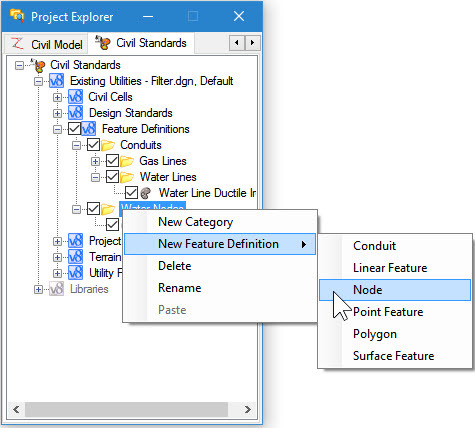 You will note that there are 6 types of feature definitions which can be defined from the Project Explorer. Linear, Point and Surface Feature Types are applicable to the road and site tools of OpenRoads. Conduit Type – this is used to define conduit feature definitions for subsurface utilities. While conduits are, in fact, a variation of the Linear Feature Definition type used in OpenRoads geometry, the Conduit type includes additional properties specific to utilities making Conduit types and Linear types of feature definition non-interchangeable. Examples of conduit types are pipes, cables and ducts. Node Type – this is used to define node feature definitions for subsurface utilities. While nodes are, in fact, a variation of the Point Feature Definition type used in OpenRoads geometry, the Node type includes additional properties specific to utilities making node types and point types of feature definition non-interchangeable. Examples of node types are catch basins, manholes, poles, pull boxes, etc. Polygon Type – this is used to define feature definitions related to hydraulic calculations which are area in nature. The most common usage is to define the catchments (drainage areas) for computing overland flow that feeds an inlet in a storm drainage network or cross-drain. Other uses are for pond feature definitions and Low Impact Development Structures (LIDS). EnvisionCAD can assist you in building your Feature Definitions for SUDA. Contact us so you get started on the right path.